Starting in 1999, twelve northern Nigerian states began the process of reimplementing full shari’ia penal codes in response to massive grassroots demand. 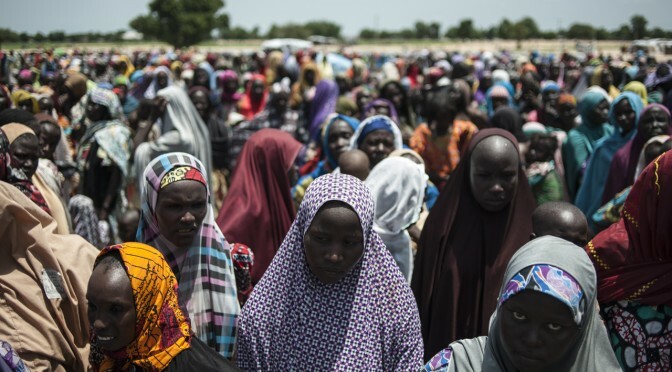 A few years later, the process was widely considered a failure and attention was turned to battling the ascendancy of Boko Haram. In 2002, a peasant woman named Amina Lawal was sentenced to death by stoning for committing the crime of zinā, or illegal sexual activity. A year later she was acquitted before attentive eyes worldwide. This lecture examines the historical and cultural factors at work in the call to reimplement sharia penal codes in Northern Nigeria, examines the stoning punishment in the Islamic tradition, and analyzes the questions of gender and the western reaction to Amina Lawal’s case. Dr. Sarah Eltantawi is a scholar of Islam. She is Member of the Faculty in Comparative Religion and Islamic Studies at the Evergreen State College in Olympia, WA (Associate Professor), and a Research Scholar at the Middle East Center of the University of Washington . She earned her PhD in the Study of Religion in 2012 from Harvard University, where she was the Jennifer W. Oppenheimer Fellow and Fellow at the Center for Public Leadership at the John F. Kennedy School of Government. She has academic fellowships at Brandeis University, UC Berkeley, and at the Forum Transregionalle at the Wissenschaftskolleg zu Berlin as well as the Freie Universität in Berlin. She obtained an MA in Middle Eastern Studies from Harvard University and a BA in Rhetoric and English literature from UC Berkeley. Her recently released book Sharia on Trial: Northern Nigeria’s Islamic Revolution (University of California, 2017), examines why Northern Nigerians took to the streets starting in 1999 to demand the reimplimentation sharia law. She uses the stoning punishment and the trial of Amina Lawal for committing adultery as her primary lens of inquiry. Dr. Eltantawi is currently at work on a new book that takes up the rise of the of the Muslim Brotherhood in Egypt from 1928 – the present, focusing on the question of the group’s “political theology” and its place in traditions of political theory. Dr. Eltantawi has also published on issues ranging from early Shi’ite jurisprudence to perceptions of “post-modernity” in Nigeria to the revolution in Egypt. She is also a political analyst, writer, and radio show host. Before taking up scholarship she had a career as policy and communications director of two American Muslim civil rights organizations in Los Angeles, Washington DC and New York City. She has been published in the New York Times, Reuters, Newsweek and more, and has appeared on the BBC, CNN, MSNBC, PBS, and is a regular news commentator for Al Jazeera English. From 2011-2015 she published a regular column in Die Tageszeitung, Germany’s fourth largest newspaper, and she hosts the radio show Contemporary Islam Considered for Marginalia Review of Books, a channel of the Los Angeles Times Review of Books. She has also been selected for the 2016-2018 speaker’s bureau of Humanities Washington, a National Endowment of the Humanities sponsored public program dedicated to sparking conversation and critical thinking in the state of Washington. 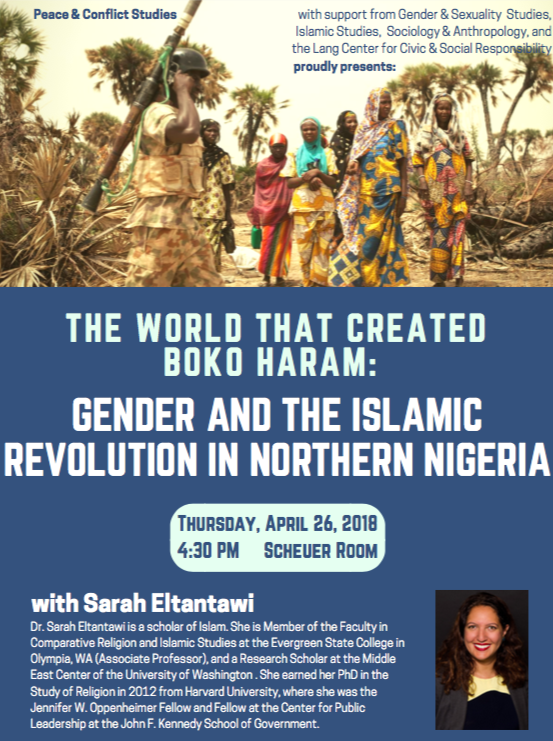 Sponsored by Peace & Conflict Studies, Gender & Sexuality Studies, Islamic Studies, the Lang Center for Civic & Social Responsibility, and the Department of Sociology & Anthropology.